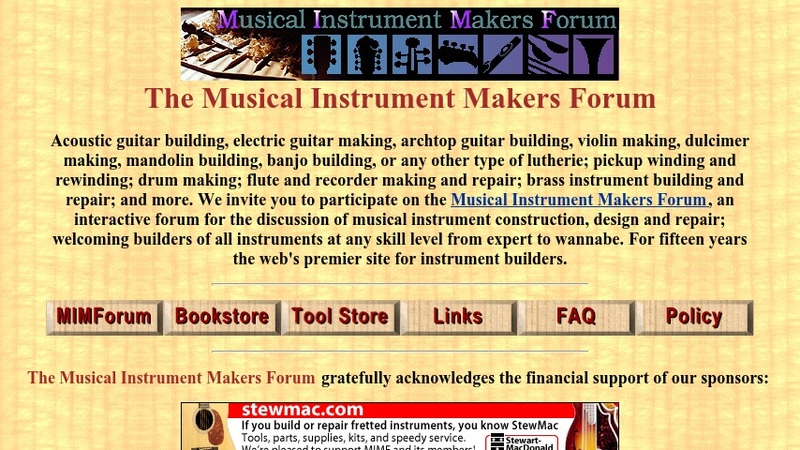 With links to over 400 pages on acoustic guitar building, violin, dulcimer, flute, recorder, and bagpipe making, brass instrument building and repair, drum making and much, much more this is the site to visit to better understand how musical instruments are made and maintained. The Forum itself hosts a long list of topics which include discussions related to everything from splitting spruce billets to how to alter a violin to better fit a musician's hand to how to use bird's eye maple in guitar building. And as if all of that were not enough the site also provides links to appropriate books, magazines and hosts a tools store section with links to wood turning tools, hand tools and everything else that's needed to keep your fiddle, guitar or flute in tip top shape.